When King Nebuchadnezzar of Babylon conquered the land of Judah, he brought back to his kingdom some of the well-favored children of Israel. Chosen were those who were without blemish, who were wise and well-educated. Among them were four young men﻿—Daniel, Hananiah, Mishael, and Azariah. The king told his servant to feed them rich foods and wines for three years, the same food he would eat himself, and then bring them before him. Daniel and his friends had been taught to eat a more healthy diet, and he made a request of the king’s servant. “Prove thy servants, I beseech thee, ten days; and let them give us pulse [seeds, grains, vegetables] to eat, and water to drink. The servant agreed. The Lord blessed the four young men for their faithfulness, and after ten days had passed, Daniel and his friends were fairer and healthier than those who ate the king’s meat. You can be like Daniel in the scriptures. You, too, know what the Lord would have you eat and drink. You know what is not good for you (see Doctrine and Covenants 89). If a king, or a friend, or anyone else tempts you to try something that is harmful to your body, say no with the same courage shown by Daniel. Color the flannel-board figures, then mount them on heavy paper. 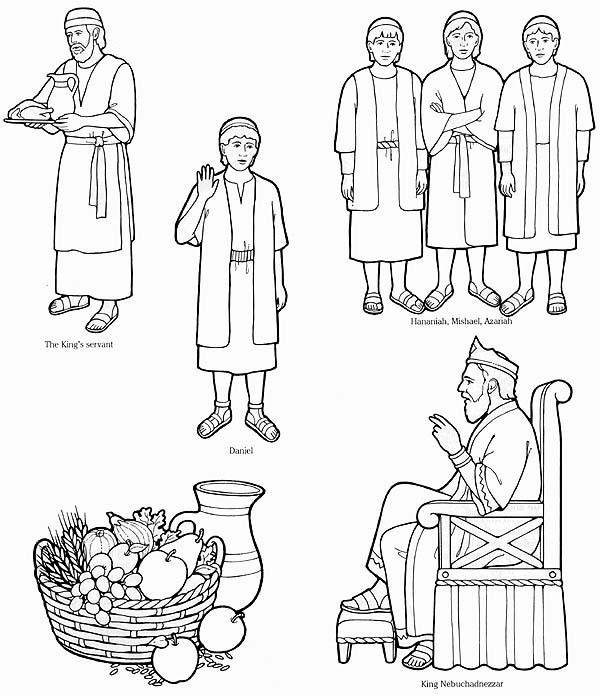 Cut them out and use them to retell the story of Daniel and his three friends. The King’s servant; Daniel; Hananiah, Mishael, Azariah; King Nebuchadnezzar.